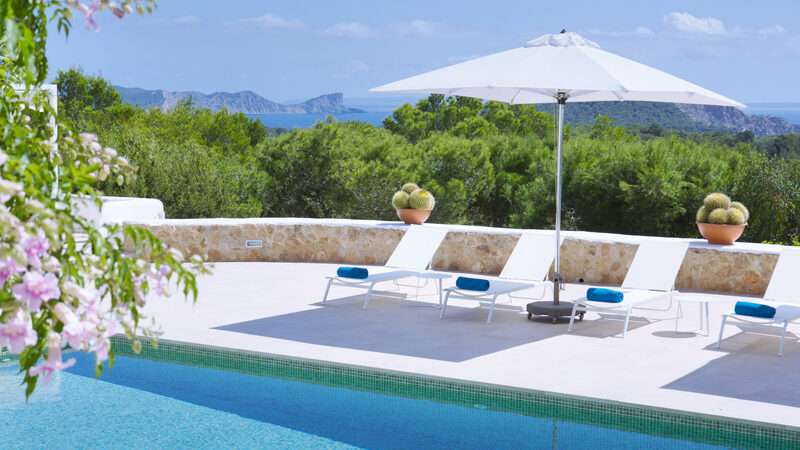 The villa Marlin is ideally located in the south of the island on the side of the hill "Puig Redo" which is one of the most secret and sought-after places of the "Jet Set" that wants to combine tranquility, privacy, luxury and proximity to the "hot Spots" of the island. 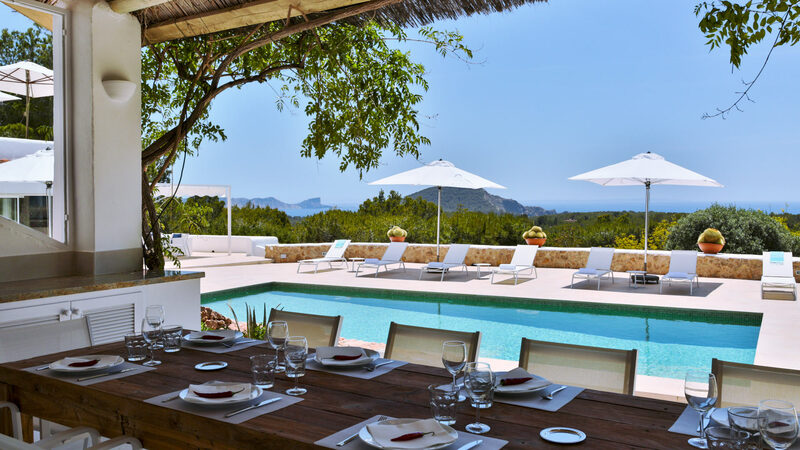 This idyllic location is close to the sea behind the famous "Cala jondal" known for the beauty of the site and the renowned beaches and establishments such as "Blue Marlin" and "Tropicana", at 10 minutes from the airport and 15 minutes driving from Ibiza city. The villa is very bright, facing south and enjoying a wonderful sea view, has been completely renovated recently by a famous French decorator who has made this unique place a paradise of good taste and originality where the 1950 vintage furniture selected in the best antique markets in France alongside comfortable leather sofas "Roche Bobois" and high quality Scandinavian furnishings. On the walls large sea-themed photos give the whole a summery touch. 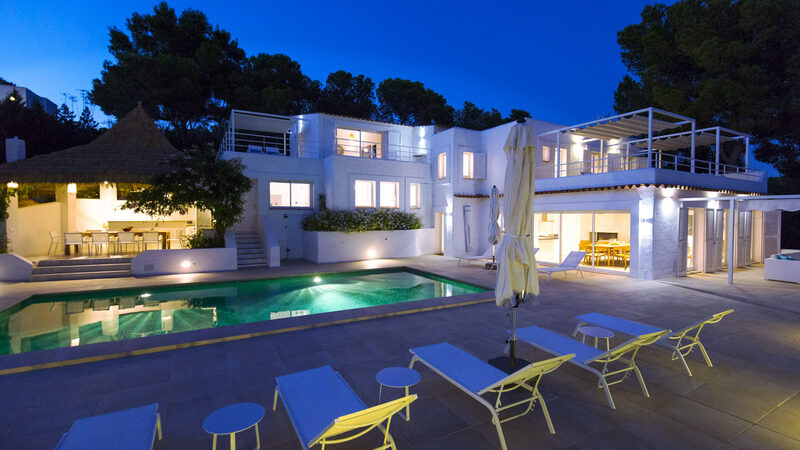 The villa Marlin and its outbuildings have 8 en suite bedrooms including 2 master suites with large equipped terraces where the sea view from Cap Des Falco until Es Cubells is very impressive. Ensuite bathroom, shower, toilet and 1 basin. Communicating towards a living room TV, sofa, office which communicates also with a twin bedroom (#2) convertible into a double bedroom (on request). This room has an ensuite bathroom, double sinks, toilet and cupboards. Ensuite bathroom, 1 basin, shower and 1 toilet. * Double bedroom (#4) with sofa, bay window overlooking a nice terrace with deckchairs and sliding pergola, sea view. Ensuite bathroom, spacious, shower, double sink, toilet. Dressing room, safe. * Double room (#5), small wicker lounge furnitures, large dressing room, TV, sea view. Opens on the terrace, pool and sea view. Sliding pergola. Ensuite bathroom, shower, toilet, bidet, 1 washbasin. On the ground floor is a large living/dining room with open kitchen where larbe bay windows overlook the terraces around the villa and where the sea view is present everywhere. The spacious terraces in front of the villa and facing the sea are equipped with an outdoor lounge where about 20 guests can sit and enjoy a drink in this enchanting place. Left side, there is a twin bedroom (#6) convertible into a double bedroom (on request) equipped with an armchair, table / desk, wardrobe, air conditioning. Ensuite bathroom with shower, basin and toilet. And a gym equipped with the best equipment: a treadmill, a exercise bike, an elliptical trainer, a weight bench. Right side, is a small independent apartment with double bedroom (#7), ensuite bathroom, shower, toilet, a washbasin. Small TV lounge, kitchenette (oven, microwave, gas hob, fridge, dishwasher), bar table. Air conditioner. Opens onto the garden. Double bedroom (#8), small office, dressing closet, air conditioning. A sliding door gives onto the bathroom with shower, double sinks, toilet. This place is perfect to receive a couple with a child or to house their staff if need be. In the middle of the main terrace there are the swimming pool and the outdoor kitchen with all the professional equipments (micro wave, fridge, plancha, gas hob, sink, dishwasher) to prepare the best dishes. View on the sea. A little further away is a pergola with a large Balinese bed where it is good to rest in the shade while watching the sea. The garden is composed of terraces where are planted olive trees, orange, mandarin and lemon trees and many mimosa. A charming path allows the guests to enjoy a walk around the property. Automatic lighting works at night. Access is via two large automatic doors located on both side of the property. Car park for 8 cars. The garden is totally enclosed.